Recently I had the pleasure of taking a trip to Maine with other painter friends. This was not a workshop. We wanted to get together to paint beautiful scenery, talk about our shared passion and enjoy each other’s company. Packing for such a trip can be a challenge. This was my fifth time to prepare for air travel with my gear and I have a system I’d like to share that works well for me. 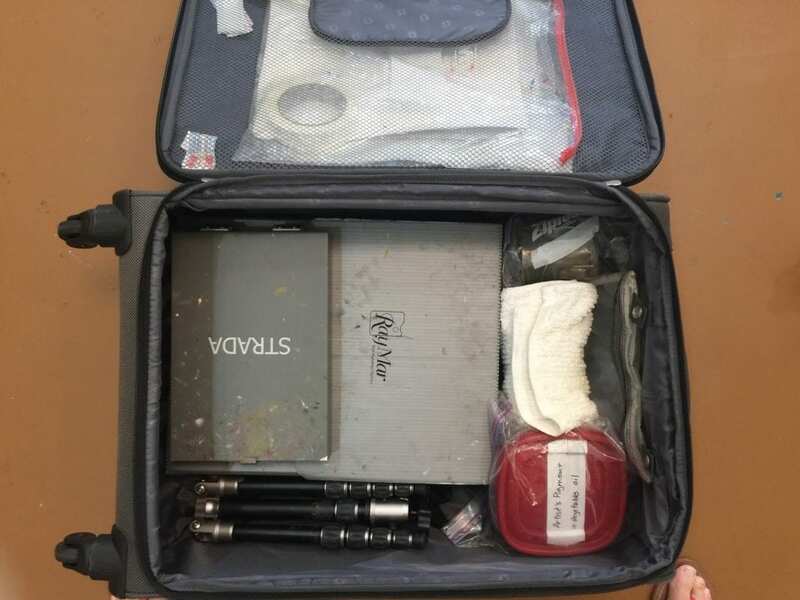 If you are bringing paint with you it will have to be in a checked bag. Another option is to ship it ahead of time. 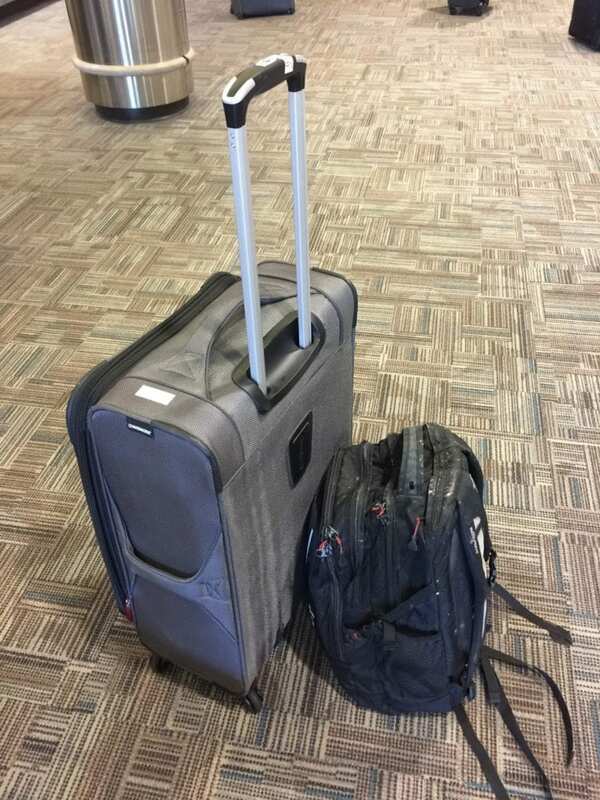 There is always a chance that your bag won’t make it to your final destination, though items shipped are occasionally lost as well. So far I have taken my chances with the airlines. 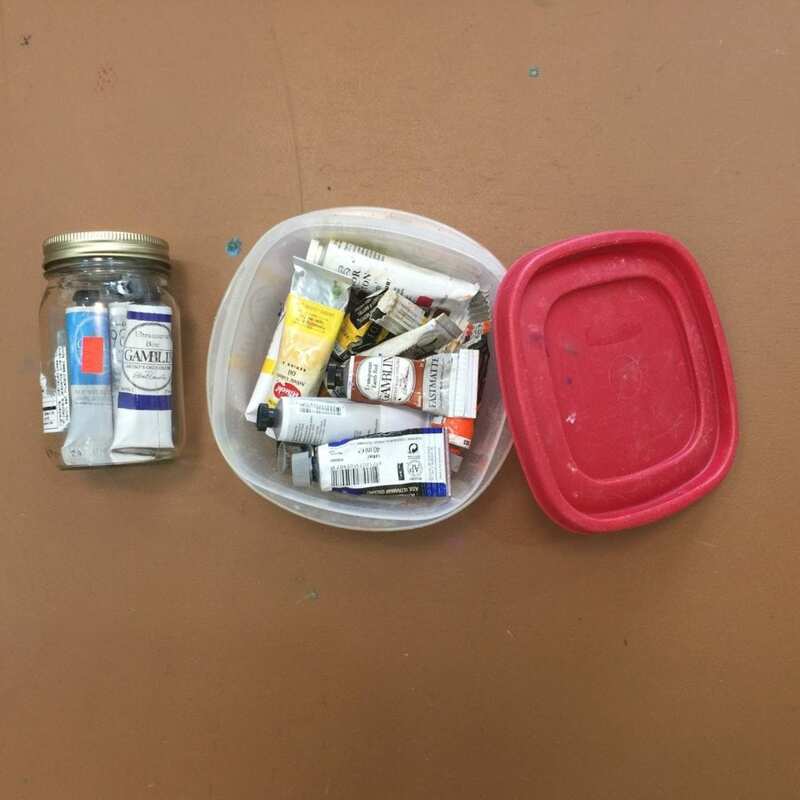 If you will be in an area with an art supply store and you don’t want to check a bag you could also opt to buy paint once you arrive. You can’t fly with mineral spirits so some kind of arrangement has to be made for that unless you use water mixable paints or some other medium. 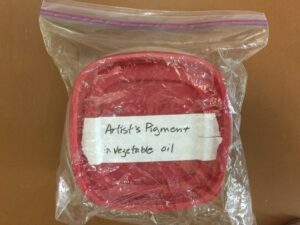 (I have a friend who has painted with nothing but vegetable oil when traveling!) For this trip, I shipped mineral spirits to a friend who was coming by car. Supports can take up a lot of space in the suitcase and add significant weight. I allow myself 3 canvases/day- 6″x8″, 8″x10″ and 9″x12″, a total of 12 for 4 days of painting. 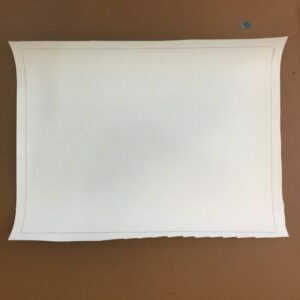 I’m talking about cut pieces of canvas, not stretched or mounted. I bring 3 plastic corrugated sheets cut to fit my wet panel carrier. 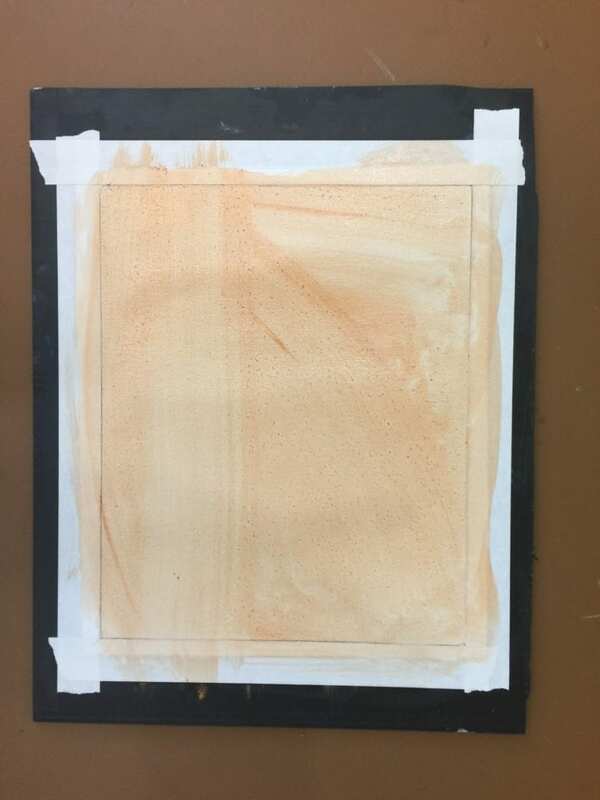 On each, I tape the panels for day one and tone them with burnt sienna. Canvas cut to the desired size with a little extra for the tape. Now taped to the plastic panel along the drawn lines, toned. I use black panels to keep the light from coming through the canvas while I’m painting. My panel carrier can hold 3 of these. 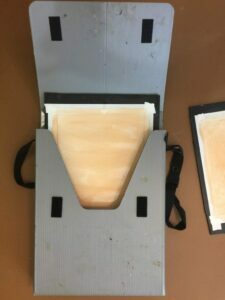 The canvas piece can be any size as long as it’s small enough to tape on the panel that fits in your carrier. At the end of the first day, I remove the paintings, tape new pieces on the plastic panels and tone them. And so on each day. 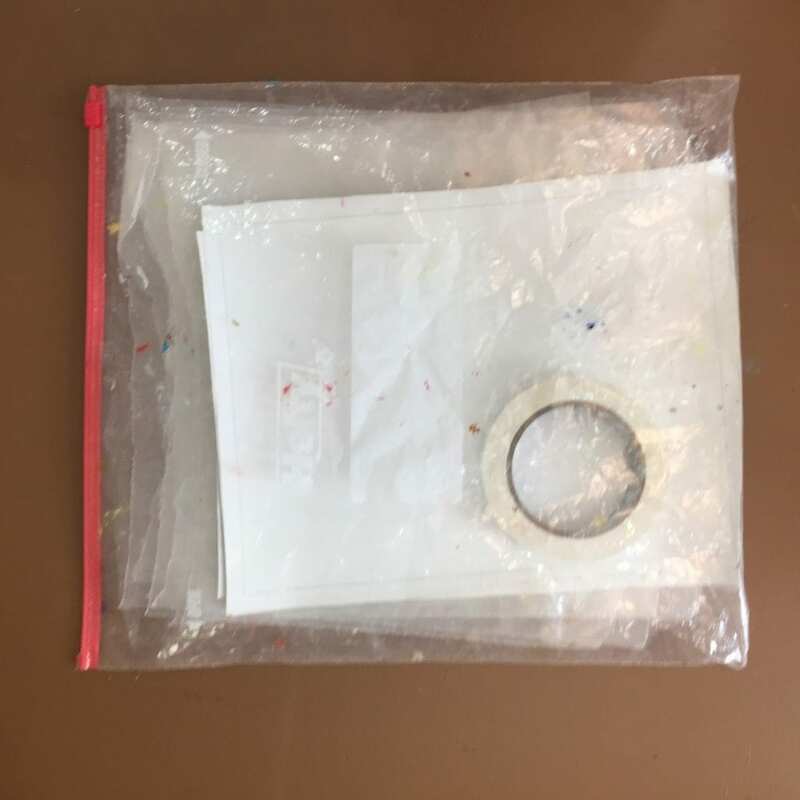 At the end of the trip, I have a very thin stack of painted canvas pieces which I put in the storage bag with wax paper in between each. The last day’s paintings go back into the wet panel carrier still taped to the panels. Any smudges/accidents that occur in transit are usually very minor and quickly touched up. 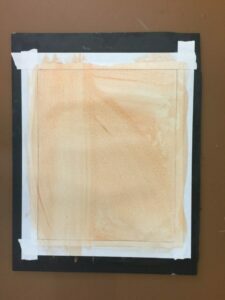 And for the “keepers”, refer to my post on mounting painted canvases on panels. I have previously posted the contents of my backpack. For travel I re-arrange things. I can’t include the small can of extra mineral spirits which I usually carry in case of spills. I have to put my paint container in the checked bag and I pack it like this- the jar with extra tubes in it is for my used mineral spirits once I’m there. It will be left behind for the trip home. I only bring small tubes on trips and I bring an extra tube of blue and white along with solvent free gel. The label says “artist’s pigment in vegetable oil”. So far my paints have not be confiscated. I also put my pochade box and my empty mineral spirit can in the checked bag. Metal containers can hold you up in security even if they are empty. This time I put my tripod in the checked bag also. This freed up lots of space in the backpack which was my carry-on. I filled it with toiletries, pajamas, sunglasses, Kindle, etc. 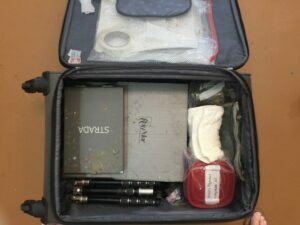 My brushes, a reusable trash bag, and smaller painting accessories stayed in the backpack. My checked bag weighs about 8 lbs. 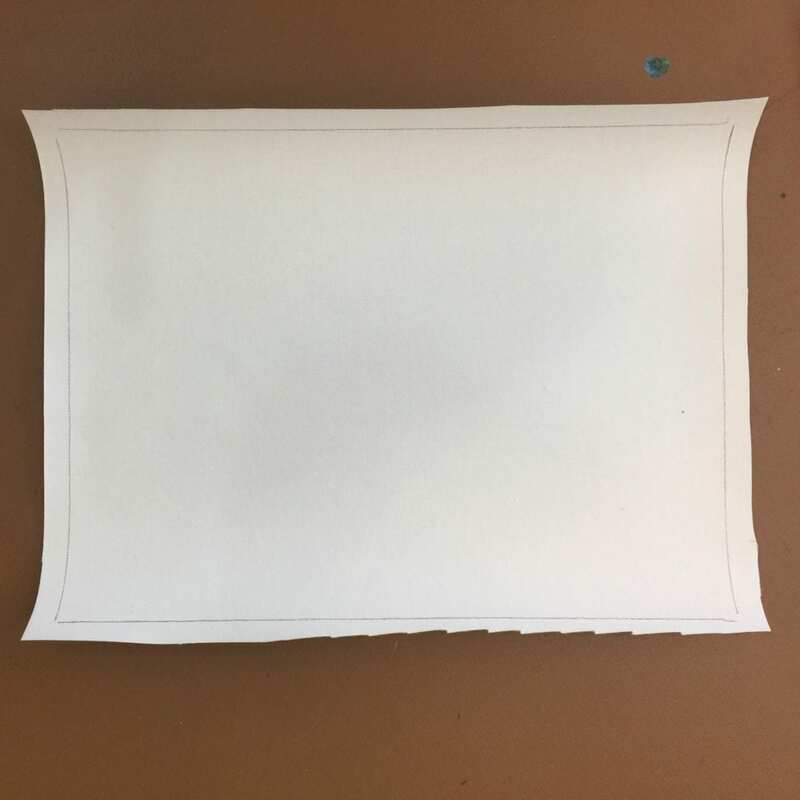 when empty and is 24″ x 10″ x 17″. This is how I pack the bottom of the suitcase- the glass jar is rolled up in a painting towel. 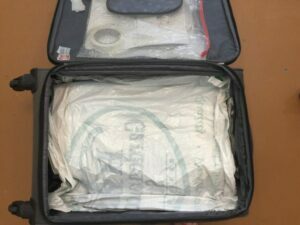 The turp can is also in a baggie because it will likely be dirty for the trip home. 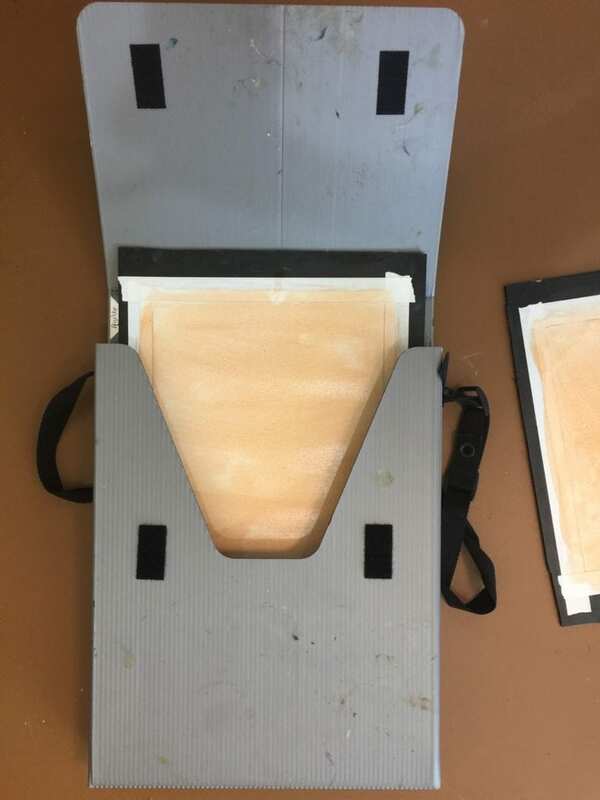 The bag with the blank canvases is in the top zipped compartment which keeps it from getting creased. Next, I put a plastic sheet on top. This keeps my clothes separated from gear, more important for the trip home in case there is wet paint on anything. There is plenty of room in this bag for paint clothes (one pair of pants, one top for every 2 days, my collapse-able hat, a hooded water-proof windbreaker) and something to wear in the evening (one pair of nice jeans and some tops). I put one pair of flats in the suitcase and wear my athletic shoes on the plane which I wear while painting. I wear jeans on the plane which gives me an extra pair just in case- I often spill coffee on whatever I’m wearing on the plane. If your hat doesn’t collapse you can wear it. So here is what I have to manage in the airport- if I carry a small purse it fits in the backpack too. This time we stayed in an inn with no elevator so I was glad I didn’t have more stuff, and getting through the airport was a breeze. I wear the backpack so I have a free hand for the coffee I’m about to spill…. More on painting trips later. This is just “Packing 101”. Here is a link for the plastic panels. Cut them to fit your carrier. Colleen Parker is a blogger and a representational oil painter with a special interest in plein air painting. Her blog is directed primarily towards emerging artists and those new to plein air. She lives with her husband Scott on Kiawah Island, SC.